Commercial facilities must develop a comprehensive security plan and be able to reassess their needs to match the world around them. There’s no “one-size-fits-all” approach towards commercial security. Every organization will have differing needs depending on size, number of facilities, kinds of potential threats, and so on. Coming up with a good commercial security plan takes a lot of factors into account and it’s best to be proactive rather than reactive. 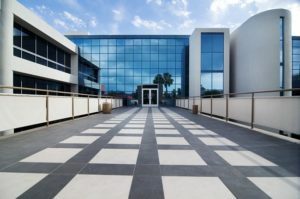 If you’re looking into how to develop a master security plan for your commercial facilities, try considering a few of the below points before you begin. What Threats May You Face? Do you have valuable customer data that may be worth stealing? Is there some kind of ideological slant associated with your business that could attract attacks? What happens to your security in the event of other emergencies, like natural disasters or fires? These are all important questions to ask before you begin developing security plans for commercial facilities. Understanding potential threats better equips you to decide what vulnerabilities exist within your current approach to security. After you’ve become aware of what threats could potentially come your way, it’s time to figure out what your current defenses are. You may have a staff of well-trained security personnel but are lacking in any of the newer intelligent security systems on the market that act as a great supplemental security precaution. Installing intelligent video equipment is a fantastic way of filling in the gaps in areas traditionally left ignored, such as secure parking facilities that may be more vulnerable than you initially realized. When putting new systems in place, it’s critical to make sure that they integrate with existing systems and that you don’t have any overlap that negatively impacts function. It’s also critical that all employees are up-to-date on understanding what systems are in place before they go live. There’s no use in installing new access control systems if every employee doesn’t know how it functions and why it benefits them. This entry was posted on Friday, April 13th, 2018 at 1:46 pm. Both comments and pings are currently closed.